The team at ResourceLink decided to follow up our recent blog post on Augmented Reality by testing it out in the ‘real world’. We have had two major opportunities over the past weeks to play in the augmented reality sphere, and we would like to share with you our experiences and hopefully inspire others to branch out into this exciting area of edtech. The first opportunity we had was at the annual Kids Connect, which is a conference run by kids, for kids, organised by Paul Shaw and the Year 7 students at St Thomas Camp Hill. The organising committee for Kids Connect, from St Thomas School Camp Hill. Last year was the first time ResourceLink team members had participated, and we blogged about our experience of developing interactive historical timelines here. 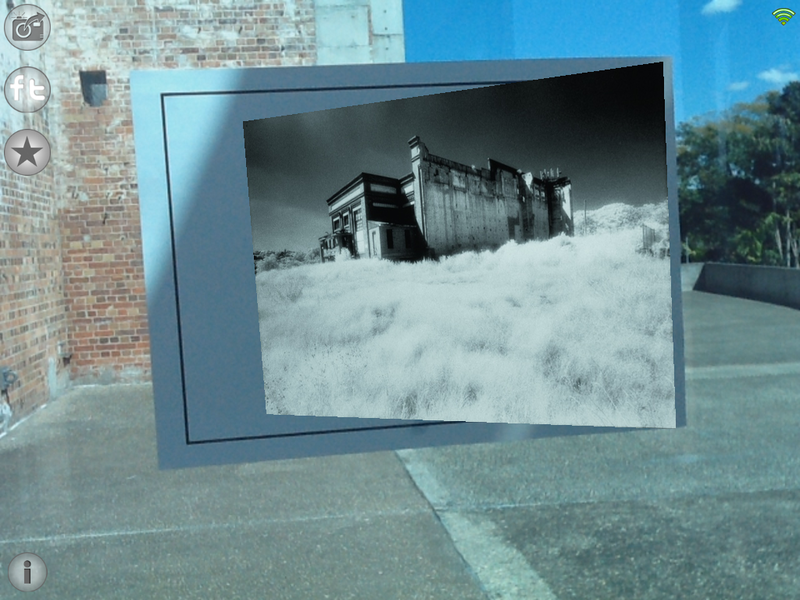 This year, with the theme of ‘Escape 2 the Future’, we decided to use Augmented Reality as a way of providing windows into the past and the future. 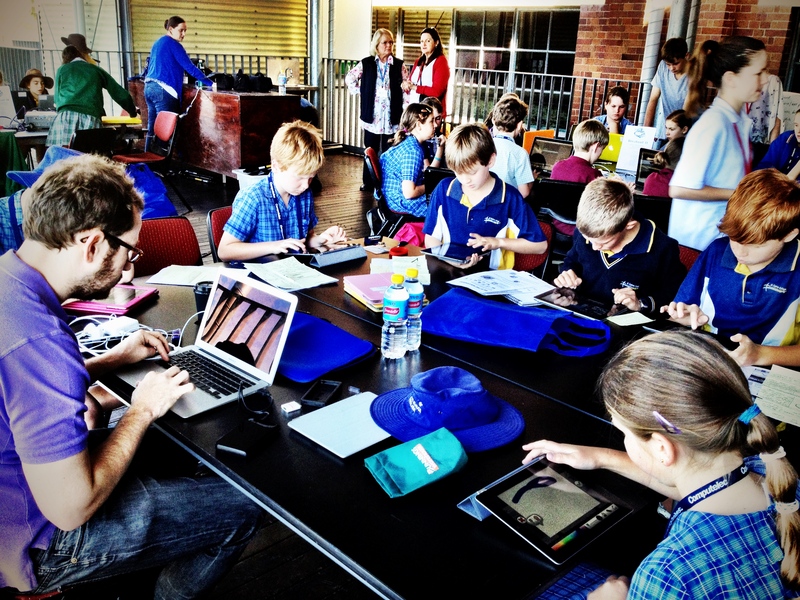 As the Kids Connect conference was once again at the amazing Brisbane Powerhouse, we knew that we could use AR technology to give the students a way of exploring the way time can be viewed as a continuum from a particular point in time. Click on the image to access information about how to download these apps to try them out for yourself. We introduced the students first to the concept of Augmented Reality by giving them a number of experiences using some of the apps we blogged about previously. 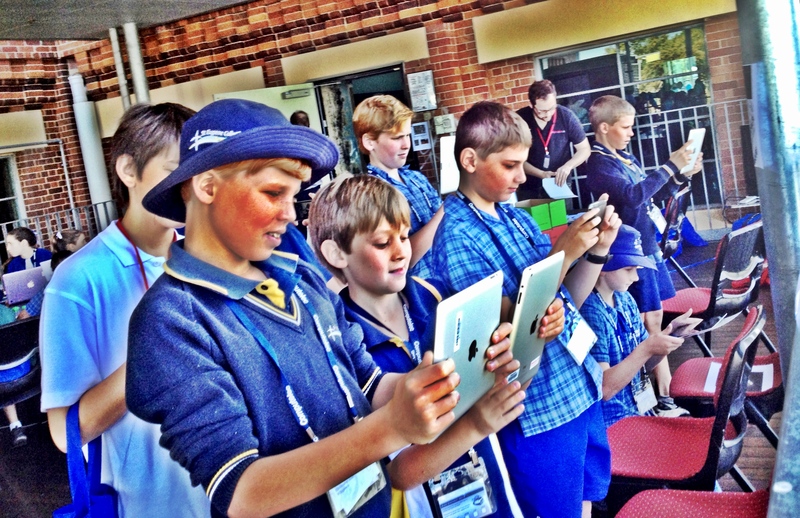 The students were immediately engaged and excited by the possibilities before them, as they viewed the different animations and movies made possible using apps such as String, HeartCam, SpidermanAR and Floodlines. The marker was a printed A4 page, with a black and white icon on it. You can see the marker to the left of the black and white photo, which is the ‘aura’ – an historical photo of the Powerhouse prior to its redevelopment. The marker was placed on the glass entry to the Powerhouse, and the exterior of the Powerhouse as it appears today can be seen through the glass in the background of the photo. Once the students had an idea of what Augmented Reality was, we sent them off on a discovery journey around the Powerhouse. We had placed markers around the building, and the students had to find the markers and using their iPad or iPod touch, view the marker through the Aurasma app. Each marker had been placed in a part of the Powerhouse where we had sourced an historical photo of the same spot. As the students viewed the markers through Aurasma, an historical photo of the place where they were standing emerged, so the students essentially had a ‘window’ into the past history of that part of the building. Once all of the markers had been discovered, the students used the app PicPlayPost to create a frame that featured their favourite ‘window’ into the past, and a video explanation of why they chose that one. To get an idea of the way places change over time, the students viewed a few short clips from Back to the Future, and made observations about the way the locations changed, and yet in some ways stayed the same as Marty McFly travelled through time. With this idea in mind, the students then explored and discussed images of the future, suggesting how they thought life might be improved through technology in the future. We then introduced the students to the Aurasma app. Aurasma is also an AR technology, and it allows you to create your own ‘auras’ which are embedded into a marker that you create. The students used a number of apps on the iPads and iPod touches including iMovie, Toontastic and Screenchomp to put together a short video depicting their vision of the future, which would act as their ‘window’ into the future. Finally, the students created their ‘markers’, which were simply A4 posters. We had pre-created ‘location’ channels for each of the mobile devices, so when the students went through the process of embedding their auras onto the posters they had created, they could upload them to the channels and share amongst each other. We did experience a few ‘glitches’ with this process, as the wireless internet was quite weak, and the student’s videos were in some cases over a minute long, however we also experienced successes with this process. 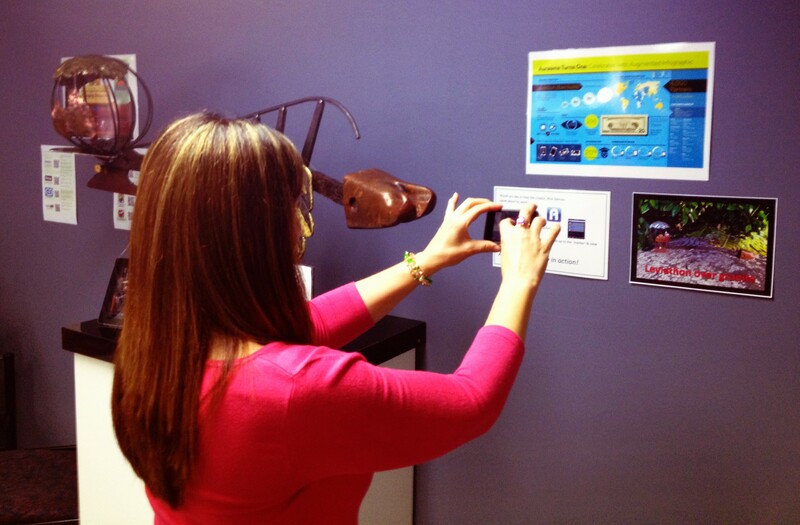 Our second AR project involved an art installation in our office, which we enhanced using the Aurasma technology. A staff member using an iPod touch to view Rick’s video from the marker. 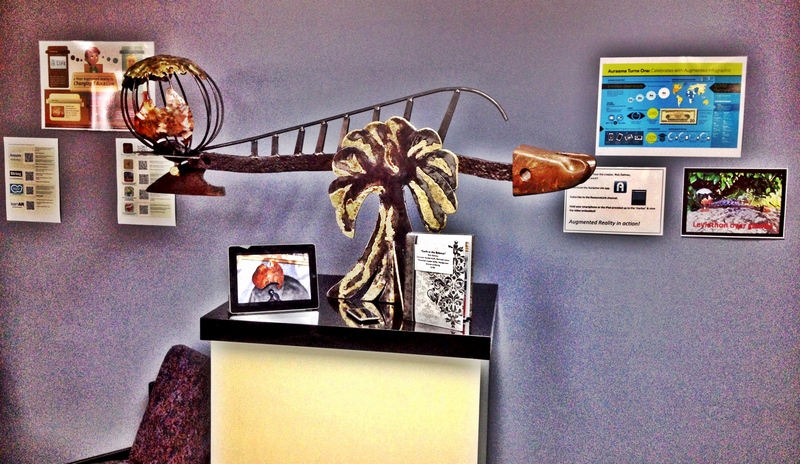 When the artist, Mr Rick Dalmau offered us the opportunity to display his work at ResourceLink, we jumped at the chance. However it quickly became apparent that Rick’s sculpture had many meanings, and that the story behind it’s construction was fascinating. So, with his permission, we created a short video of him explaining how the piece came together, and we used the Aurasma Studio app to embed this movie into a marker we created using one of his photos of the piece. Entitled ‘Earth in the Balance’, the piece is created from a variety of found objects. If you wish to hear Rick speak about his creation, simply download this PDF Leviathan over granite . Download the Aurasma app, and search for the ‘ResourceLink Auras’ channel, and subscribe. Once you have subscribed, simply hold your device, with the app open over the printed pdf, and the video should begin playing. Double click on the video to make it full screen. Make sure your volume is on full! Augmented Reality has really added to ways we can share information, and enhance our resources and displays – if you have any exciting ways you have used AR, please share in the comments below!